I’ve recently enjoyed reading this book, researched and written by Stephen Lally. 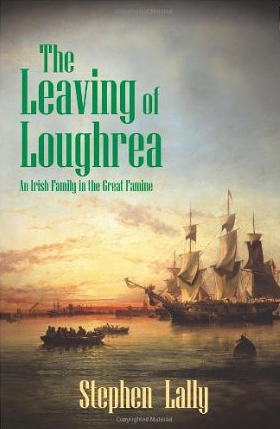 It’s a fascinating account of the Lally family in the area around the town of Loughrea in Galway. It is of particular relevance to me, because it’s about the family of my 4x great grandfather, Patrick Lally. But the combination of general Irish history, local Galway history and family history makes this an informative read for anyone interested in their Irish ancestors during the time of the famine. Stephen Lally covers the social and political factors leading to the great famine, conditions for the poor in Loughrea, and gives vivid and detailed accounts of the journeys of Lallys out of Galway to America, Canada and Australia. It shows how the story of one family can be used to illustrate the lives and times of many others, so if you’re tracing your Irish family history during the 1840s and 1850s, it’s well worth a read. This entry was posted in Family History Hive, Resources on 3 May 2014 by ellen.